By davidf, November 11, 2012 in Plugins - Publishing ONLY! Draws an initial line instead of just a dot. The dialog is now resizeable (thanks to midora). 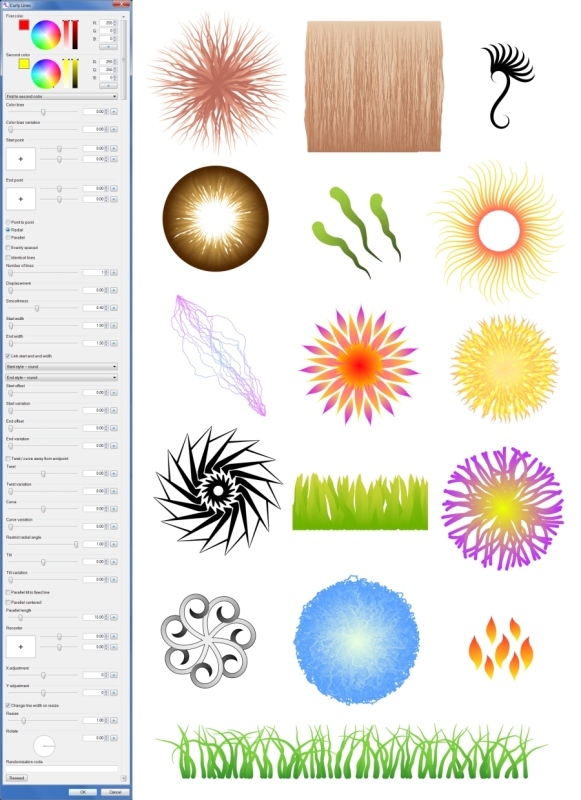 Two new color modes: "First to second color -- across width" and "Emboss", along with "Emboss angle". "Start radial direction is random". The PDF guide has been updated too, though it only describes the new controls very briefly. (Note: the dialog shown below is for version 1.0). Have fun! I'd love to see people's pics. Known bugs: As mentioned in the PDF guide, this plugin has a problem handling lines with high widths and chaotic (low smoothness) lines or the "short sharp" end style. Hope that doesn't put people off too much! Normally you only need to use a small number of parameters at a time. For example, to draw a star, click Radial then set Displacement to zero, Number of lines to 10 (or whatever) and move the start end and end points. (Then change Start width and the colors). Some plugins suit simple interfaces but its good to have ones with plenty of parameters to 'tinker' with too! 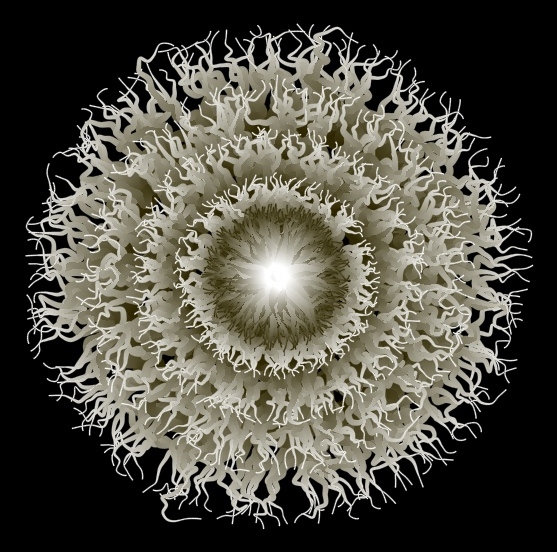 Awesome, thanks so much, it generates some cool shapes. Amazing. 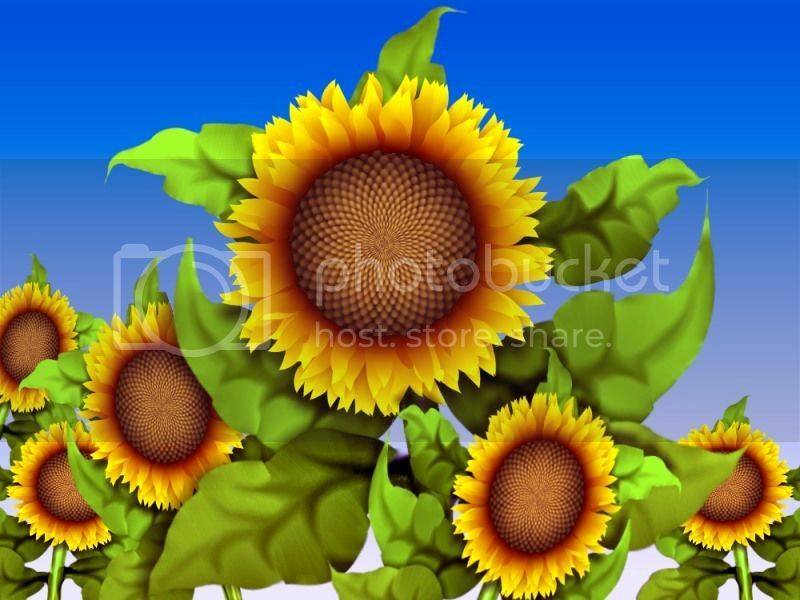 I reconize the flower petals, but how did you do the inside of the sunflowers and the veins in the leaves? I'm guessing that the leaves are based on your new Cell Texture plugin! And many thanks for the time you spent for the community in the last weeks creating these great plugins. It would be nice if you could add the parameters you used to create the examples. Maybe we could discuss a general way for plugins how to get and put whole sets of plugin parameters (i.e. using an XML description). And I'm happy that you implemented a solution for the reseed (as I just proposed in developer central). Looks like a simullar understanding of the issue. the center made using a different technique, the plugin wasn't involved, it is Diagonal Cross bucket fill, some displacement then Polar transformation plugin. 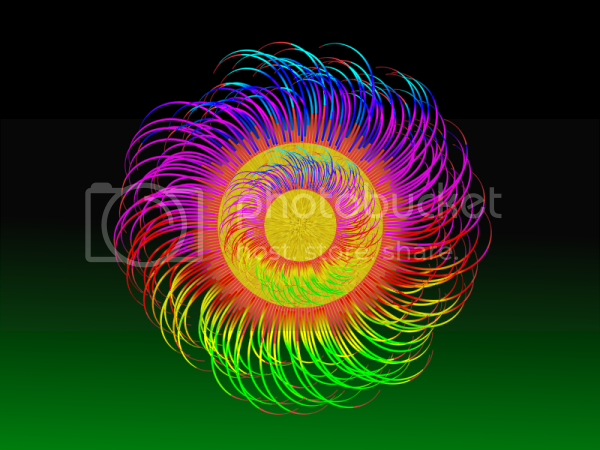 And in this one, just the sparks are curly lines plugin. If I could remember them all! I did write some down, actually. Is there a particular example you were wanting parameters for? Being able to save and restore a set of parameters via XML sounds like a good idea. Ideally, pressing Reseed should fill in the Randomization code field (with a random string). It would be good to have a Reset all button that sets all of the parameters to their default values. Is there a safe way to set control values programmatically for a PropertyBasedEffect? That's one of the effects I had in mind when I started writing the plugin (as well as the idea of electricity flowing between two points). It was originally called Lightning / curve. One parameter I didn't get around to adding was "fork" (or "split") to make lightning more realistic and create fractal-looking tree things. 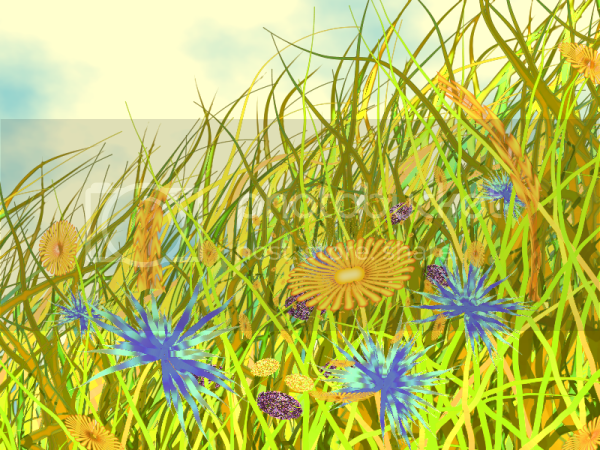 I'm really enjoying this plugin - just had fun making a meadow! It could be useful to have shading across the width of the line too? (if not too cumbersome to add). This could be from the primary color, as adding another color wheel would make UI even bigger. Just think it might add more 'depth' when using it for grass/flowers. The branching idea sound good too! Seeing some of the examples here of what this plugin can do is really impressive. I hope to have a play around and try to come up with something too. Top marks davidf for writing this, kudos to yellowman & Red ochre for showing us what can be done. As I've said before - people who create these plug-ins have my upmost respect and I thank you for doing them (I'd love to know how you do them ... is it like writing a programme for a hard drive, perhaps?). Forgive me Red Ochre if I didn't do my quote right. Davidf, your plug-in is amazing. Unlike Yellowman I had to read the PDF. All I came up with at first was a few squiggly lines, so Thank You for writing that. I was trying to make a sun and thought the same thought as Red Ochre about side shading. Great plugin . Thanks very much. It would reduce the size of the UI considerably and make it more user friendly. Once again davidf you excel, another very useful plugin to have. By duplicating layers, using conditional hue/saturation adding a little a bit of rotate/zoom, a touch of yellow circle, mixed with some zoom blur on the smaller layer, I managed to make this fairly quickly. Thanks, I'll include that in the next version. Width-wise instead of length-wise shading sounds good ... it would help with "flame" images and things like that. The next version might not be for a little while, though. (There are some links to tutorials in the first post in that thread).